Squirting hot water through a nozzle, to produce a fine spray, increases the surface area of water in contact with the air, liberating dissolved substances in a process known as "stripping." So if we want to avoid those chemicals drinking bottled water is not enough. Chemically sensitive individuals would also have to wear a gas mask in the shower, and when unloading the dishwasher if they want to avoid chemical contamination. And even then the skin will absorb directly in the shower chemicals like fluoride so we cannot assume we are safe from the contaminants even if we are drinking pure water. The majority of people still take the purity of their tap water for granted when they shouldn't. The consequence though is extraordinarily high for exposure to lead in drinking water which results in delays in physical and mental development, along with slight deficits in attention span and learning abilities. In adults, it can cause increases in blood pressure. Adults who drink this water over many years could develop kidney problems or high blood pressure according to the American EPA [v]. The Romans had their engineers turn the populace into neurological cripples when they started using lead in their water systems but they did not have to deal with either fluoride or mercury. 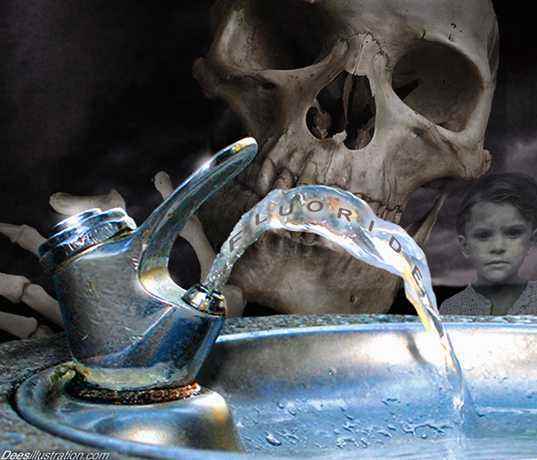 The three together, mercury, lead and fluoride become a kind of devil's triangle of chemical toxicity that is only made worse by aluminum and a host of other hostile chemicals that are clogging up our bodies. Water pollution by drugs is an emerging issue that is extremely important. Pharmaceuticals are now attracting attention as a whole new class of water pollutants. At the recent American Chemical Society conference, Chris Metcalfe of Trent University in Ontario reported finding a vast array of drugs leaving Canadian sewage treatment plants. Padma Venkatraman, a postdoctoral fellow at Johns Hopkins concluded that antidepressants, anticonvulsants, anticancer drugs and antimicrobials are among the pharmaceuticals most likely to be found at "toxicologically significant levels" in the environment. It is hard to tell which is worse, the toxic chemicals and drugs that are leeching into the public water systems or the noxious chemicals deliberately put in the water by public health officials. Standard water treatments result in health threats yet health officials are loath to admit any problem that we should beware of. Chlorination of drinking water supplies virtually eliminates most disease or bacterial contamination, but creates traces of several toxic by-products in drinking water -- such as chloroform, trihalomethanes and other chlorinated organic compounds. In recent years municipal water districts across the United States are changing the way they disinfect public water supplies. Many are adding ammonia to chlorinated water to produce chloramines [vii], or chloraminated water. They are doing that in order to meet standards set by the U.S. Environmental Protection Agency (EPA). While chloramination has been used as a way to lower the level of carcinogenic disinfection byproducts (DBPs) created by chlorination, it has led to extreme water toxicity. Chloraminated water kills fish and reptiles and there is no reason to believe it is safe for human consumption. "I almost died," Denise Kula Johnson of Menlo Park said the day after chloramines were added to her water supply. "I was in the shower and suddenly I could not breathe. I passed out on the floor. I was terrified." "The government is hiding the fact that the drinking water is not usable," says medical scientist Dr. Winn Parker who tells us that the most at-risk groups from chloraminated water are the fetus in the first trimester, children to age three, people over age 60 and those with human immunodeficiency virus (HIV). Women in the 35-45 age group are at risk of recurring rashes on the inner thighs and chest, he added. Parker is calling for government funding of alternative disinfection methods, such as ultra-violet and reverse osmosis, which would make harmful chemical disinfection methods obsolete. "We need to amend the Constitution," Parker said, "to give the people in each state the right to vote on what goes into their water. "[viii] A recently discovered disinfection byproduct iodoacetic acid, found in U.S. drinking water treated with chloramines, is the most toxic ever found according to Dr. Michael J. Plewa, a genetic toxicology expert at the University of Illinois [ix]. "The drinking water lead crisis in Washington D.C. poses serious public health risks to thousands of residents of the national capital area, and casts a dark shadow of doubt over the ability, resources, or will of federal and local officials to fulfill their duty to protect our health," said Paul D. Schwartz, National Policy Coordinator, Clean Water Action [xii]. After switching to chloraminated water, children in Washington ingested more than 60 times the EPA's maximum level of lead with one glass of water [xiii]. Jim Elder, who headed the EPA's drinking water program from 1991 to 1995, said he fears that utilities are engaging in "widespread fraud and manipulation. It's time to reconsider whether water utilities can be trusted with this crucial responsibility of protecting the public. I fear for the safety of our nation's drinking water. Apparently, it's a real crap shoot as to what's going to come out of the tap and whether it will be healthy or not." Underground aquifers can become contaminated with bacteria and viruses because of insufficient topsoil layers to filter rainwater as it trickles down to recharge the groundwater. Livestock manure, human sewage sludge, fertilizers, weed killers [xv] and pesticides seep down into groundwater supplies. The intensification of agricultural practices -- in particular, the heavy use of fertilizers and pesticides -- has had a huge impact on water quality. The main agricultural water pollutants are nitrates[xvi], phosphorus, and pesticides. Rising nitrate concentrations threaten the quality of drinking water, while high pesticide use contributes substantially to the direct poisoning of our water supplies. The Netherlands National Institute of Public Health and Environmental Protection (RIVM, 1992) concluded that "groundwater is threatened by pesticides in all European states." WHO (1993) has established drinking water guidelines for 33 pesticides but an awareness is growing that in all matters water related we are not being protected from serious harm. There really is no limit to the concerns and chemicals that make drinking public water a bad idea. There really is no end to the serious problems with tap water that are being seriously underestimated. The National Academy of Sciences has concluded that arsenic is so dangerous in drinking water that stringent levels set by the Clinton administration and later suspended by the Bush White House were not strict enough. For decades, the Environmental Protection Agency set an acceptable arsenic level of 50 parts per billion in drinking water. But recent studies suggested that this level was too high and increased the risk of bladder and lung cancer. A report by the National Academy of Sciences in 1999 said the standard should be made stricter "as promptly as possible." President Bill Clinton ordered the limit to be lowered to 10 parts per billion in 2006 and scientists doubt if even this low level of concentration is safe [xvii]. iv. Drinking Water Act in 1996 banned plumbing devices with pure lead pipe but still allows low levels of lead. Homes built before 1986 are more likely to have lead pipes, fixtures and solder. However, new homes are also at risk: even legally "lead-free" plumbing may contain up to 8 percent lead. The most common problem is with brass or chrome-plated brass faucets and fixtures which can leach significant amounts of lead into the water, especially hot water.